Why Is The Wall Street Journal Publishing a Puff Piece on Donald Trump’s Campaign Manager? Corey Lewandowski is described as just like his boss Donald Trump--and incidentally, he's a prince among men! I didn’t have to think too deeply about the tone and import of Monica Langley’s profile of Donald Trump campaign manager Corey Lewandowski for The Wall Street Journal: I found it on Trump’s campaign website. 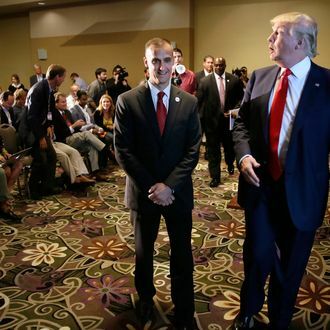 In a stairwell behind the stage as Republican presidential candidate Donald Trump spoke at a packed rally recently, campaign manager Corey R. Lewandowski lashed out at his New Hampshire state director. Now, that could be interpreted as a tyrannical and temperamental campaign manager scapegoating and browbeating an underling and then abruptly terminating him or her via a one-person kangaroo court. But Langley treats it as Lewandowski personally saving Trump’s bacon in New Hampshire, and not asking anyone to do what he and “my boss” are unwilling to do. She also reports he was “prepared” to resign his very well-paid gig if Trump lost the primary, which (a) cannot be verified and (b) was never that likely a prospect according to the polls. Mr. Lewandowski, who downs a dozen Red Bull and Monster Energy drinks daily, resembles his boss in many ways. He’s brash and ambitious, demands loyalty and subsists on little sleep. After Iowa, Mr. Lewandowski said he became “more motivated, not distressed.” His 68-year-old mother made calls from one of four Trump phone banks; his wife supervised their 9-year-old daughter, seven-year-old twins, nieces, nephews and cousins to stuff envelopes around the family dining-room table outside Manchester. Maybe it’s just a psychic flash, or perhaps a blood-sugar spike from reading Langley’s piece, but I’m getting the feeling The Wall Street Journal is putting the training wheels on a test drive with Trump. It’s amazing how different new and scary things look once you adopt a positive attitude.